New cameras are teaching us more about where missed shots land than ever before. Early in the fourth quarter of an April game against Orlando, Chicago’s Jimmer Fredette came off a Taj Gibson screen and rose up for a left wing 3. As the ball arced toward the rim, Joakim Noah raced from the elbow toward the restricted area.Fredette’s shot missed, glancing off the rim, off the glass, and falling down just on the right side of the hoop. In one smooth motion, Noah rose up, gathered the rebound, and dropped it down into the cylinder for an easy two points. He was in the perfect place at the perfect time. Maybe this was good fortune. Maybe it was something else. It looked like he knew exactly where the rebound was going to go. In a way, he probably did. Hundreds of hours on the court shaped his instincts. For a basketball player, that kind of feel for the game is a sixth sense. Noah relied on those instincts, that sense, to battle the seemingly random nature of where a missed shot will go. What if he didn’t have to? Welcome to the NBA’s surveillance age. Because of advanced tracking cameras and the data they provide, we know which NBA players run the fastest, which pass the most, and how much they dribble and where. Those fancy cameras, hidden in the rafters of NBA arenas, are tracking more than just players. They’re also capturing the precise position of the basketball, 24 times per second. The NBA’s SportVU system was originally intended to promote strategic analytics among the teams, but the data set has a lot more to say, and a lot more to contribute, than just newfangled scouting reports. It can also help answer age-old basketball questions. Like, where do rebounds go? During the 2013-14 regular season, players missed well over 100,000 field goal attempts. Misses mean rebounds, and those rebounds help shape the outcome of every game. For years, basketball coaches and players have meditated on rebounding. When shots go up, players begin fighting for position. The very idea of boxing out involves putting yourself in an optimal position to catch a potential miss by clearing out space in the zone where a rebound is most likely to be had. However, since most missed shots necessarily involve the ball ricocheting off some combination of iron and glass, there’s no way to predict exactly where rebounds will go. Because of this, even the best rebounding intelligence is still informal. This is where that new player tracking system comes in. I explored this idea two years ago on my old blog, but the results were coarse and left many key questions unanswered. 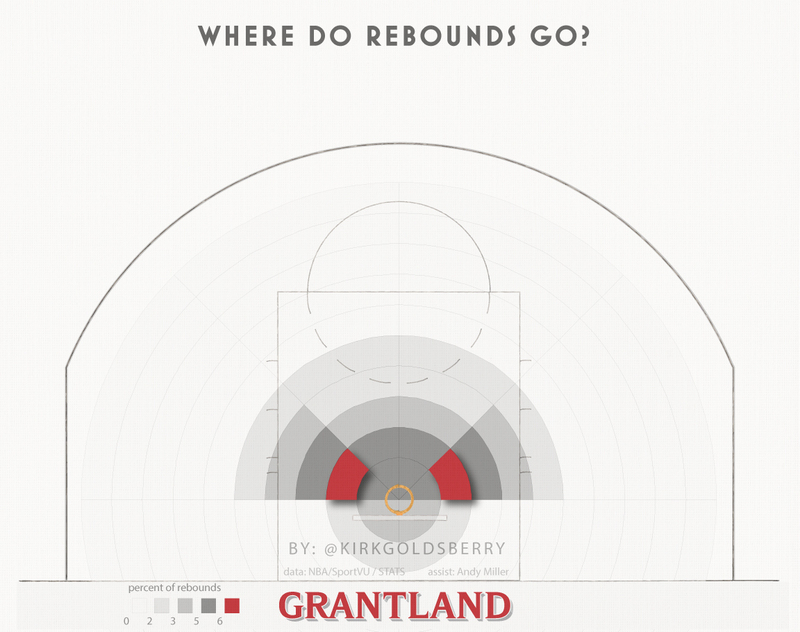 The following graphic demonstrates the interactions between shot locations and rebound locations.3 The graphic is interactive. Roll your cursor over any spot on the court to see what kind of rebound any given shot produces. I asked web cartographer Andy Woodruff to help with the construction of this graphic. He created the slick interface that really helps understand how the nature of a missed shot attempt affects the subsequent rebound. The apples don’t fall far from the tree. Last year, almost 80 percent of all NBA rebounds happened within eight feet of the hoop. It’s also worth noting that rebounds, overall, exhibit a very symmetrical spatial signature around the basket. Using SportVU data provided exclusively to Grantland by STATS LLC and the NBA, I explored the nature of 95,000 rebounds from the 2013-14 NBA season. I looked at the exact location where the rebound was acquired, along with the location of its preceding shot attempt. 3. There will be randomness. However, even the longest misses produce an average rebound distance that is only eight feet from the rim — not exactly a remote location. Part of this has to do with physics, part has to do with player spacing. Long-range shots generally occur when players are more spread out and there are fewer potential rebounders near the basket. Rebound locations also greatly depend on the angle of their parent shots. To illustrate this idea, consider missed corner 3s from last season. 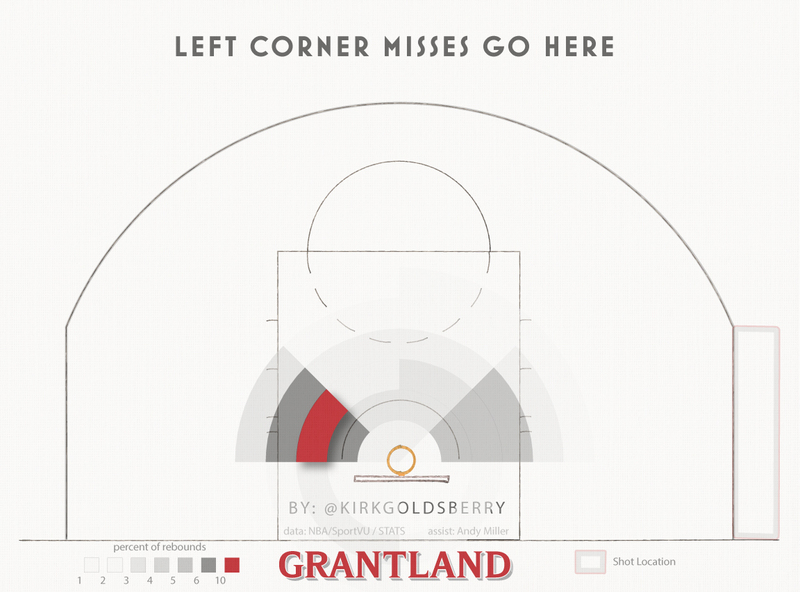 In accordance with the distance effect, a missed corner 3 elicits a relatively long rebound (average length = 7.3 feet), but the location of that rebound depends a lot on which corner the missed shot originated in. 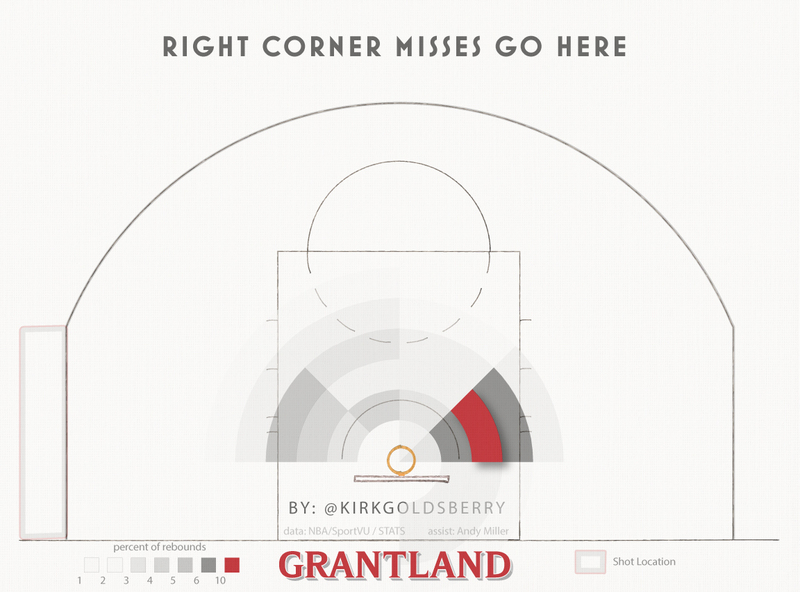 This graphic shows the most common rebound location for missed left corner 3s (graphic right). As you can see, more rebounds are acquired on the weak side (i.e., the non-shooting side) than the strong side (the shooting side). And over 10 percent of rebounds land in a relatively tiny portion of weakside space, just beyond the restricted area. 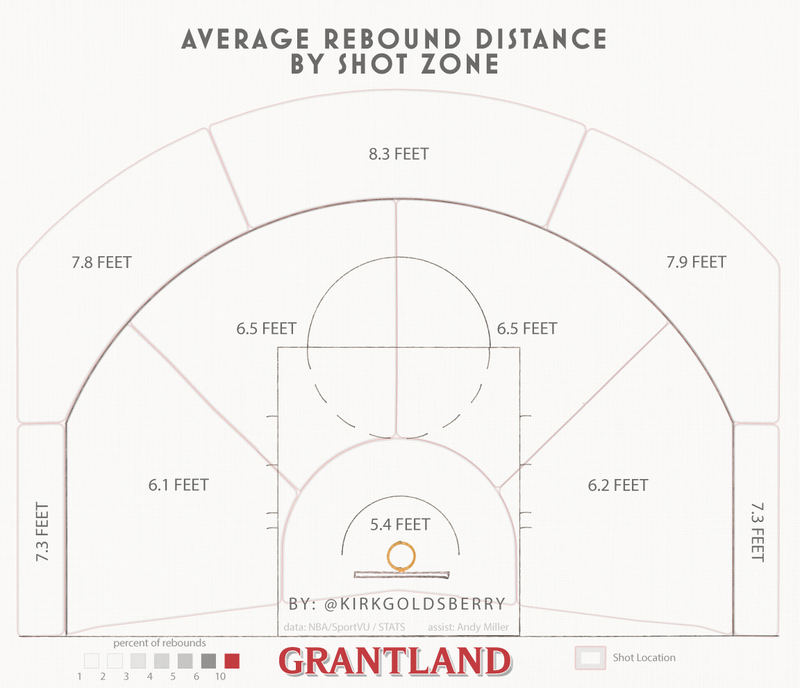 Unsurprisingly, misses from the opposite corner produce a mirror image of rebounding opportunities. Just how strong is this weakside bias? At first blush, it looks quite heavy, but it’s a little more complicated than that. The magnitude of the weakside effect depends on the nature of the ricochet. Shorter rebounds exhibit considerable weakside bias, longer rebounds do not. Professor John Fontanella, author of The Physics of Basketball and professor emeritus of physics at the United States Naval Academy, says the weakside bias can be explained using fundamental science. “The basketball tends to go to the other side of the basket for rebounds because of Newton’s First Law, the relevant part of which is ‘an object in motion continues in motion unless acted on by a force.’ Consequently, a basketball traveling from left to right will continue on its path unless it hits the rim, in which case the rim exerts a force on the ball. Professional basketball players rarely shoot air balls — their misses usually collide with the rim in some fashion. When the ball comes off the rim, rebounding locations are more difficult to predict than with air balls. Because of that chaos, the conclusion that rebounds have an overwhelming tendency to land on the weak side is an exaggeration. A majority of missed shots tend to end up on the weak side, but that majority is slim. Consider these two missed corner 3s from Corey Brewer last season. In the first example, Brewer misses short, causing a relatively violent collision with the front edge of the rim. Unsurprisingly, this collision creates a bounce that forcefully returns the ball to the shooting side, where it’s gathered by Robin Lopez. In this second example, Brewer misses in a slightly more typical fashion. The ball bounces off the back iron and goes upward on its way to the weak side, where Chandler Parsons awaits. Through a holistic lens, the weakside effect appears faint; after all, only 56 percent of missed corner 3s end up rebounded on the weak side. But a closer look shows something intriguing: Shorter typical rebounds — like the one gathered by Parsons — exhibit weakside bias a lot more than so-called long rebounds do. As it turns out, long rebounds are completely different animals. Even though they account for only 20 percent of the league’s rebounds, long boards are noteworthy because they actually exhibit a strongside bias that flies in the face of the typical weakside bias. Why is this? The best answer I got for this question came from Charlie Rohlf, one of the technical gurus behind the league’s tracking system (and a former manager under Mike Krzyzewski at Duke). Rohlf hypothesizes that the most “violent” collisions with the rim, those that beget long rebounds, are most likely to occur at places on the iron that will send the ball back toward its origin. In order to bounce/glance off of the rim with enough horizontal velocity to travel 8 feet, the ball must hit the very front of the front rim (to bounce back toward the shooter) or the inside edge of the front rim (to bounce away from the shooter). There is a larger range of angles at which the ball can hit the front of the front rim than the back of the front rim. The majority of the range of visible angles still results in the ball gently bouncing up. But when only considering violent bounces, there is a larger range off the front of the front rim than the inside, back edge of the front rim. Every missed field goal is like an unfolding physics demonstration. Although the outcome is always guided by fundamental principles, the beauty of rebounds remains in those randomizing effects that screw up destiny and keep us all on our toes. The direction effect is both real and intriguing, but it’s still less relevant than the basic fact that most rebounds end up very close to the basket. In fact, the best rebounding advice probably remains to “put a body” on someone and box them out, therein maximizing your ability to grab those close rebounds easier than your opponent could. It’s worth noting that the most famous rebound of my lifetime exhibited both the distance effect and the direction effect to a tee. NBA players are extremely tall and athletic. They grab rebounds higher in the air and closer to the basket than the average YMCA player. The rebound locations in this data set reflect that. It’s safe to say that, relative to the NBA, rebounds tend to be retrieved lower and farther from the basket in the average pickup game. Rebounds, with their reliable uncertainty, are part of what makes basketball beautiful. There are general rules that dictate the nature of missed shots. But thanks to the perfect design of the basketball hoop, there will always be randomness. No matter how good our cameras get, there are still things that only Jo knows. Special thanks to Andy Woodruff, Ryan Warkins, STATS LLC, NBA.com, and Andy Miller. This article has been updated to correct the name of the Bulls shooter mentioned in the first paragraph. It was Jimmer Fredette, not Mike Dunleavy.